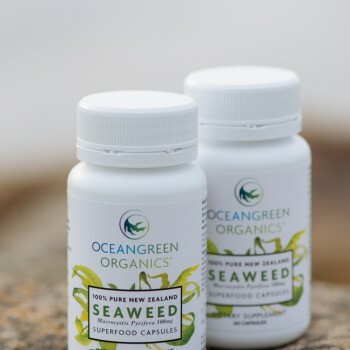 Our company is called New Zealand Southern Pacific Seaweed Company and products are brought to you by our brand Oceangreen Organics. We are a small passionate business that is harnessing the hidden treasures of seaweed by producing a range of seaweed-based products. We look forward to sharing these products with you. I have an affinity with the ocean and what is within it having grown up by the seaside in my childhood. When I met a seaweed harvester I knew I wanted to harness this wonderful ocean goodness and its bountiful nutrients by developing them into a range of consumer products. The health benefits of seaweed are numerous and need to be accessible to a wider audience. After extensive research and talking to many people in the ‘know’, Oceangreen Organics was born. We are a niche and environmentally conscientious business in the world of seaweed-based products. We are not a large mass produced corporation. We are based in New Zealand – and only produce New Zealand seaweed. ​We only harvest what we need, and produce extremely high-quality supplements with you in mind. Our pure, clean and nutrient rich waters are absorbed into the seaweed which in turn produce‘world class seaweed’. Because it absorbs the nutrients from its surrounding marine environment we can guarantee that this seaweed rates up there as one of the best kelp varieties in the world.